As young architects/interns, we know how it goes: task, deadline, do this, do that, lots of overtime, nose-to-the-grindstone, workaholic employment. For many of us, it’s been hard to find work. For others, like myself, I am blessed to have work, but am frustrated by the office culture of the old-school, hierachial, corporate-style firm. I feel stuck on a sort-of plateau where I don’t feel like I’m going anywhere. Isn’t it time for AE firms to change their style? In this, Part 4 of “The [arch] Office” series, we will see some great advancements ARCHITECT Magazine found in forward-thinking AE firms…as well as the challenges firms face in attracting and holding their talent. Since the 2008 start of the recession, design fields have seen a decline in new talent entering the industry. People have left the profession and schools are seeing a decline in new students. Now, firms exercising the old, hierarchial, sweatshop-style office are discovering problems staying ahead because they can’t hold on to talent. To best discuss this topic, ARCHITECT Magazine did a great job of showcasing a few specific firms (and I’m sure there are more out there). I will do the same, dividing this post into each firm and highlighting their story, then concluding with some overall thoughts. I hope you get as excited as I did reading this! Say goodbye to the “cutthroat, pay-your-dues philosophy” of the architecture office. Founded in 1949, the Seattle office set up its camp in a converted waterfront industrial pier and boasts a beautiful sunlit studio. Why is this place so great you ask? First is the commute: employees are encouraged to walk or bike to work and are met with a three-car hybrid fleet for employees to share among the office. And with ample bike parking, on-site showers, and REI gift card incentives, why wouldn’t you want to commute this way? Second is the office: Instead of the principals hogging the views with their perimeter offices, everyone gets a view of nearby Elliot Bay and surrounding mountains. You sit where it makes most sense for your current projects, which allows new and/or young employees to sit with senior partners and other office disciplines. Third, some cool perks: Friday happy hour, Mithuniversity, an employee-curated gallery space for insipiration, and even scholarships for doing things OUTSIDE architecture. 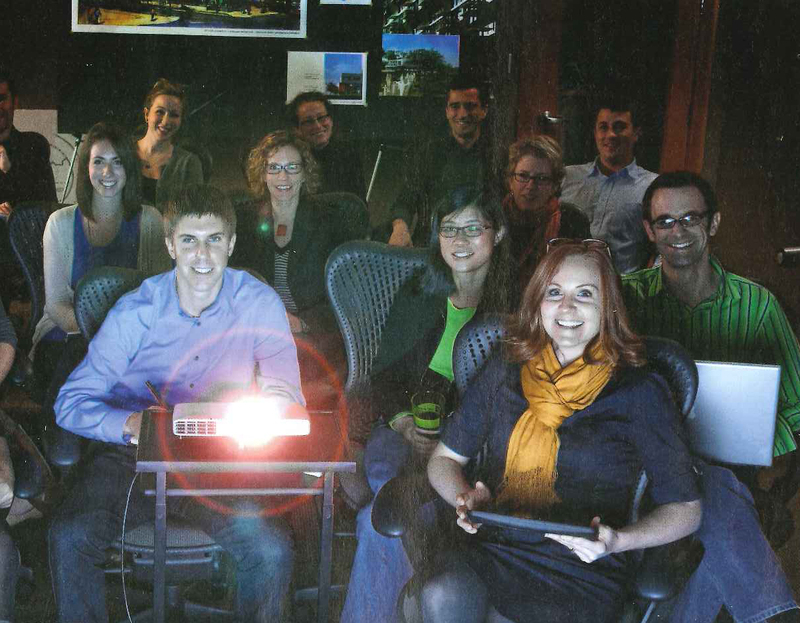 Wait, did I just say that a firm is encouraging you to learn OUTSIDE of architecture? The best example is Brendan Connolly, a partner at Mithun that won the scholarship. He used the scholarship to take a jewelry making class and made an engagement ring for his wife. How great is that?! ” ‘It’s incentive to learn new things, and for me it was great to take a class that was not about architecture.’ “ Obviously, this is exciting for employees to read/hear about. In my opinion, it also positive for firms, as Mithun is discovering. Their employees can bring new skills with them that not only enhances them personally, but also enhances their professional growth and skill-sets for their projects. Wow! I was blown away by this. While many firms only look at the hard, bottom line numbers, Jerdonek is noticing that the indirect, immeasurable benefits of positive office culture far exceeds those numbers…and will only make the bottom line better. Employees at Luckett and Farley are very happy with their leadership. They listen to their employees, offer opportunities for access to a wide range of people, and help foster their growth. Those leaders have an especially difficult battle in the balance between Baby Boomers, Gen-X, and Gen-Y employees, which is evident at many firms. As Jerdonek explains, the Baby Boomers and Gen-X staff have seen it all but have less capacity for today’s innovation and technology. On the other hand, Gen-Y staff are incredibly more comfortable with technology and forward thinking, but lack context and experience in understanding. The marriage and collaboration of these generations is critical. Like many people, Barbara Irwin, of HR Advisors Group, has noticed the difficulty firms are having with the generation gaps. Many firms are having difficulty understanding how to handle their younger staff. Understandably so, in my opinion, as the industry has been changing so rapidly that it is hard to keep up the pace. Irwin is finding that many firms are struggling with keeping our younger generation happy and can not seem to recruit and keep their younger generation staff. Surveys are finding that communication is the single biggest issue. ” ‘They just wanted what was going on in the firm, how they were doing, how the firm was doing,’ ” Irwin states. I can relate to that completely. At my current firm, feedback is few and far between. I have even asked for feedback from people, only to get a few brief comments or “yeah, we’ll talk later.” Oh, that talk didn’t happen by the way. And usually I hear updates about the firm through rumors. It becomes rather frustrating. What about an email? Respect…that is something I’m hearing about more frequently. “Creating a culture of respect – of listening and engaging and mentoring one another – is at the heart of Mithun’s policy.” They understand that an idea can come from anywhere, and anyone is invited to pull up a chair. Now that is the environment I want to work in! Stay tuned for Part 5: Grow next Monday, June 4th!